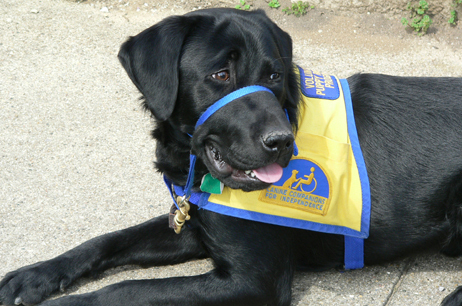 A personal story from one of our volunteer puppy raisers. I raised my first Canine Companions dog, Langland, beginning in June 2012 for my school’s Personal Project; a long-term project carried out by the 10th grade students at my school every year for the curriculum. I had learned about CCI from stories that my parents told us of their first CCI dog that they raised before I was born, Volpert, who graduated as a service dog 1 week after I was born. Seeing the opportunity to learn more about raising a dog and the responsibility, I applied to raise a puppy. One of the most memorable stories of Langland was the first time we took him to the vet. During his check-up, the veterinarian used spray cheese to distract him while she examined him. From that day forward it was safe to say that the vet was Langland’s favorite place to go. I’d recommend volunteering to raise a puppy, especially if you plan on having a pet dog at some point, to learn how to teach obedience and socialization. This is not only a learning process for the dog, but for the humans as well.